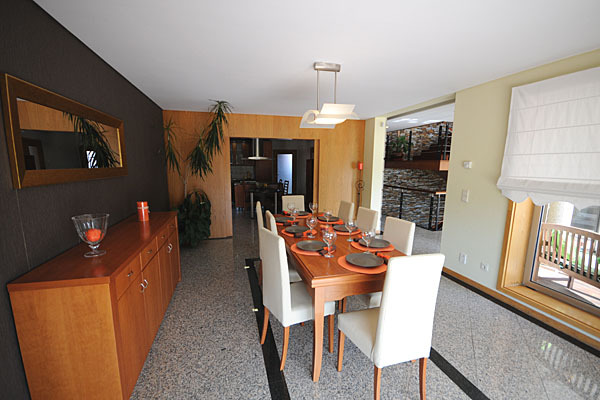 This extremely tasteful and comfortable villa is set just outside the coastal resort of Esposende with long sandy beaches and many other attractions to make your holiday memorable. Looking across agricultural fields down to the village centre, the villa offers excellent facilities such as private swimming pool, grass football field with volleybal net, home cinema, table tennis, etc. Large games room with table tennis and pool table. Home cinema room with good quality screen and sound system. Fully fitted modern kitchen with doors opening onto an excellent and well equipped covered barbecue area. Dining room with table seating 10 people. spacious living room with comfortable seating, satellite TV and DVD player. Doors opening onto the pool terrace. 1 bedrooms with twin beds and adjacent shower room. Laundry room. Master double bedroom with ensuite bathroom and doors opening onto a large balcony with uninterrupted views over the countryside. Two extra bedrooms each with a double bed and one of them with another private balcony. Full bathroom. Spacious covered barbecue area ideal for alfresco dining. Private pool (10 X 5 metres and the depth is from 0.90 metres to 1.85 metres). 5 a side football playground (grass). Well maintained large gardens with mature trees and private vineyard.